Oodua Peoples Congress (OPC) has alleged that there are plans by a Lagos politician to assassinate its National Coordinator, Otunba Gani Adams. The organisation, in a press statement, signed by its publicity secretary, Barrister Yinka Oguntimehin on Friday from Istanbul, Turkey, said the plan followed the recent suspension of some erring members of the congress. “This is to alert concerned Nigerians that after several failed attempts to remove the leader of the Odua Peoples Congress by expelled members of the Congress,security report at our disposal revealed that a top Lagos based politician has devised ways to create chaos and attack the convoy of Otunba Gani Adams soon after the handover of Government to Gen. Buhari,” the statement said. “The plan is to make use of the media to publish negative stories on the person of Otunba Gani Adams, using a political party propaganda machinery which failed despite several sponsored negative stories on his person. They now want to create chaos by attacking the convoy of the National leader of the congress. “A meeting held yesterday (Thursday) at the residence of Razak Balogun, (Sadam) an expelled member of the Congress,at Oloworo road,in Oworonsoki,Lagos, was attended by 35 grassroot members of a zone, where a decision was reached that a 3-man committee which include Hamza Adeshina (Biggy),Ranti Akande(Otepa) and Shina Akinpelu to monitor Otunba Gani Adams movement from his Festac town residence to his office and provide information as regards the day to day movement of Otunba Adams. We are also aware that the Lagos based politician has already distributed modern arms including AK-47 guns which was collected two days ago and delivered by Shina Akinpelu,” OPC alleged in the statement. The organisation stated that it was imperative for it to “bring to the attention of the world, the sinister plot to eliminate Otunba Gani Adams and should the attempt fail or we repel the attack,they will feed the media with false information further claiming that OPC is made up of thugs and touts. 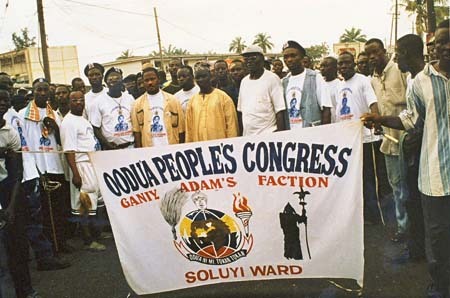 “Despite the efforts of Otunba Adams to promote the culture and tradition of his race,and upgrade the status of the Oodua Peoples Congress to a socially responsible one, and the formation of Odua Progressive Union (OPU), which is presently active in 57 countries, a platform for Yorubas in diaspora to interact and channel their energy towards the propagation of the culture and tradition of the race and in turn build a clear cut tourism platform and image perception for the country, a move he just established in Instabul last week friday,and Dubai yesterday,some bad elements are desperate to draw the organisation back to the jungle days because of their desperate interests. “We are also aware that another meeting will hold this afternoon at the Oworonshoki residence of Sadam. We therefore call on Nigerians and security agents to be aware of this plot while we keep vigil of their next moves,” the statement added. According to the OPC publicity secretary, Oguntimeyin, those planning to attack Gani Adams have been getting huge funding from a Lagos-based politician.